Delightful self contained one double bedroom ground floor apartment - so peaceful, so private, you won't want to leave! 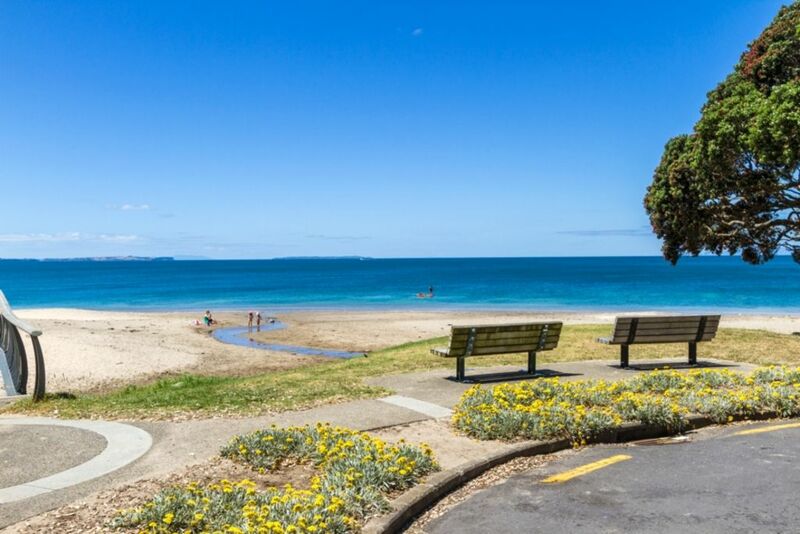 Located in one of Auckland's most popular North Shore's beachside suburbs - just a few metres to beautiful Campbells Bay Beach. Continental Breakfast or a cooked English Breakfast is available on request at an extra charge. Please note that there are no cooking facilities in the apartment. Your apartment has its own entrance, lounge and dining area with tea and coffee making facilities - an excellent library and an assortment of games for those rare rainy days, a foot spa, and neck massager to help you unwind. Easy access offstreet parking is available onsite. Nestled in a beautiful garden setting you will enjoy your own private outdoor covered loggia and sunny garden seating area under the Magnolia tree, surrounded by Roses, Gardenias, Irises and Hydrangeas. Safe swimming and beach or bush walks are virtually on your doorstep. Local bus transport is literally at the end of the driveway and there’s access to motorways not too far away. Beautiful beaches, Centennial Park - Tennis and Golf Course just up the road. Movie Theatres and Albany Mega Centre around 10 minutes drive away. The Bays are renowned for their local cafes and restaurants - closeby, Mairangi Bay Shopping Village provides great boutique shopping together with a comprehensive supermarket. Your own space has lounge/dining/bathroom/separate toilet, double bedroom with a queen size bed - laundry facilities are available using a shared washing machine an dryer. Ironing Board and clothesline are also available. Free WiFi is also available. TV and selection of DVD's and CD's are also available for you to enjoy. Sorry - no animals are permitted – Trish, your host lives above, on the property as do Charlie the nine year old Bichon/Poodle, Marco Polo - 17 year old cat and Sammy - the baby pussycat. These pets are part of the family. We look forward to meeting you! Closeby Mairangi Bay for boutique shopping, exquisite dining, cafes and bars. Trish (and Charlie) were great hosts and took very good care of us. Everything we needed was there, including towels for the beach. The accommodation was easy to find. The space was clean and very comfortable. A beautiful beach was a few minutes walk away and was practically deserted at the time of our visit (late March). This beach is on the North Shore City Coastal Walk trail, which is 23.5 km of beautiful trail on the beach (best to go at low tide). A Dairy and an amazing Greek/Italian restaurant is ~0.25 miles away. My husband and I wouldn't hesitate to stay here again. We stayed with 3 different hosts on our trip to New Zealand and Trish is in a class all by herself. The apartment was clean as can be and the she made the stay more memorable with great breakfasts and recommending local attractions. We especially enjoyed Waiheke Island that wasn't even on our list and turned out to be one of our best days. I would definitely recommended Trish to family and friends. The ground floor apartment is lovely, the garden pretty and peaceful and it’s a short walk to the beach. Enjoyed having air conditioning to combat the heat. Accommodation very tidy. Short walk to beach and boardwalk along bays.